I've mirrored this post over at yours.org - a new blogging site where you can tip people for their posts. It's a bitcoin thing, I'm still learning about it. Anyway, if you'd like to tip me, go to the post here, and do that. Why wouldn't you? Let's be honest here. 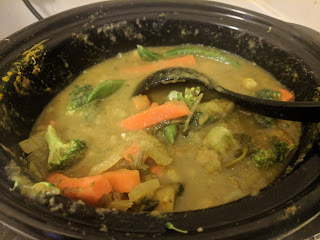 Concerning "food", as a vegan I obviously recommend vegetables but the idea here, fitting with the idea of soup in general, is that you can use more or less anything edible. Any liquefied food is soup. It's just a question of what you like to eat. Do you like to eat soup? There's something wrong with you if you don't. Read on. It was still delicious; earthier and deeper. Mature soup. Aged. It occurred to me that, rather like with pickle, this is a process you can continue more or less indefinitely. Drink your soup, as space becomes available in the pot, add more ingredients, and repeat. Never-ending soup. Time you're shopping hours right, and you can gather ingredients to sustain you for days on a couple of quid. It's like soylent, but less pretentious and more low-tech. Leave your slow cooker on 'low' all or most of the time. If your soup goes completely cold, you might be wary of reheating it again for hygiene reasons. So far I have had no issues with this - the spices and salt add not only flavour but also preservatives (in a manner of speaking). Drink your soup at regular intervals throughout the day, topping up as you go along. This is a also a good dietary habit to get into - little and often, rather than gorging on huge meals or succumbing to the munchies late at night. All things considered, it's really an approach to soup with no downsides whatsoever, and one I highly recommend. 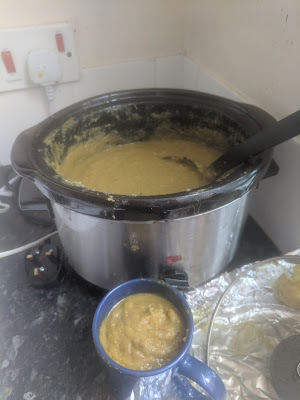 (Soup-related posts have also, curiously, been some of most popular on this blog - see "related links" below for more).